Jerad Eickhoff, pitching here against the Mets in his final start of 2015, threw off the mound for the first time this spring on Thursday in Clearwater. CLEARWATER, Fla. – Jerad Eickhoff should be able to catch up with the rest of the projected starting rotation in the near future. Eickhoff threw his first bullpen session of the spring on Thursday morning in Clearwater. It was exactly two weeks earlier that he suffered a small, non-displaced feature on the outside of his right thumb during bunting practice. Is Howard's pain Ruf's (and Phillies') gain? “Just fastballs, getting back in the zone, getting that feel back,” said Eickhoff, who still feels a little discomfort in the thumb when gripping his secondary pitches. The Phillies will play their first exhibition game on Sunday against the University of Tampa and then open the Grapefruit League schedule on Tuesday. 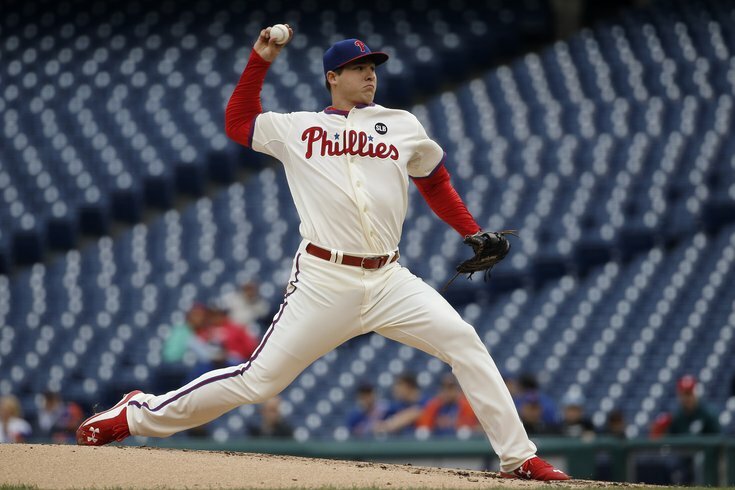 It’s possible that Eickhoff could jump into games before the first week of games draws to a close. “I got the arm moving which is the biggest thing,” he said of his progression Thursday. Manager Pete Mackanin said both Jeremy Hellickson and Aaron Nola will see an inning of work in Sunday’s game against the University of Tampa. Cody Asche took a break from batting practice and work in the field after suffering what he called “a minor tweak” of his right oblique. “Since it’s February, so we’ll just take a couple of days,” Asche said after the Phillies workout on Thursday. Asche, who is primed to see action in left field, third base and first base this spring, said the pain had been around for a couple of days, but it felt particularly sore when he woke up Thursday morning. He expects to be ready for the Grapefruit League opener on Tuesday. “It’s just something you have to let heal,” he said. “We have, what, five days until the first game? So hopefully we’ll give it a few days and I’ll be out there vs. the Blue Jays." Hard-throwing right-handed reliever Jimmy Cordero has yet to throw in a bullpen session after a week of workouts in Clearwater. Mackanin said it was a “biceps issue.” Cordero, 24, came over in the July trade that sent Ben Revere to Toronto and was clocked over the winter at 104-MPH. Mackanin said he was going to have to work in managerial jogging practice into the spring schedule after Major League Baseball issued two new rules on Thursday. The first rule, the latest in the league’s conscience effort to increase the pace of play, is installing timed 30-second visits” to the mound by managers and pitching coaches. Mackanin thinks it’s doable. The collisions into second base became baseball’s biggest story last fall after Utley took out Ruben Tejada in a National League Division Series Game between the Dodgers and Mets. Although that play drew the most attention, another incident that cost the Pittsburgh Pirates rookie infielder Jung Ho Kang also got the conversation started a month earlier.